Submitted an abstract for PCSGA! 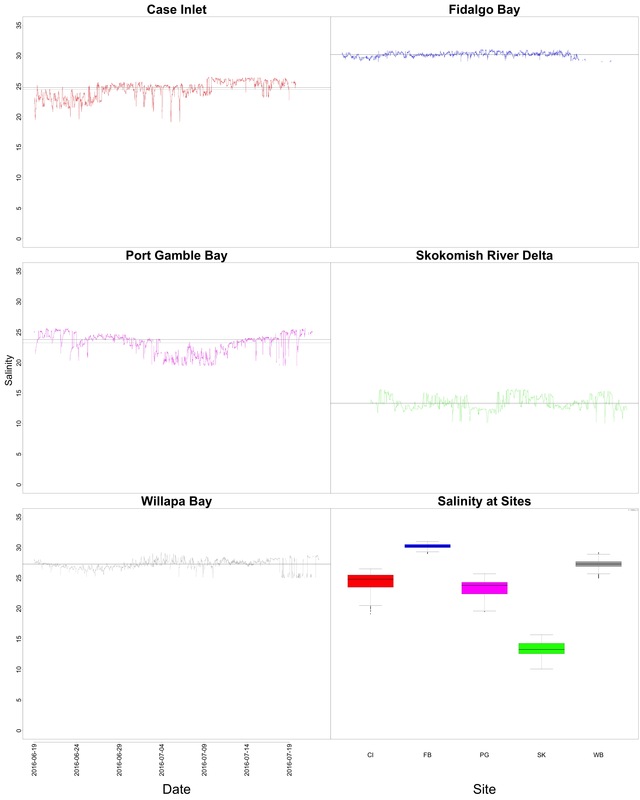 Qualitative: Looking at these data, I think something went wrong at Case Inlet Eelgrass, Fidalgo Bay Bare, and Willapa Bay Bare. Declining values or sporadic low values suggest that the instruments were buried or clogged at some point. Skokomish Bare and Skokomish Eelgrass had really different salinities! I then ran the revised salinity data through this script to quality control it using tidal data, then created graphs with this script. I still need to run it through this script to extract important environmental variables. However, I saw that Willapa Bay no longer has the lowest salinity! Figures 1-2. Boxplot and diurnal fluctuations of salinity during the outplant. Alex and Micah were suspicious about the low salinity values, so at least I have correct data now. The sad part is that there’s no longer a salinity explanation for my data! I’m going to rework my discussion to focus a bit more on temperature. Then, I’m going to do a preliminary analysis of the NANOOS chlorophyll data. Woot. Use sed to find lines that begin with desired text and then fill in space after with desired text. Also, since the text being inserted is a path, the slashes would screw up the sed command, so you can (and need) to use character other than slash to separate sed commands. Any character will work, as long as it isn’t present in your string of characters being inserted. I used a percent symbol.